For it has been reported to me about you, my brothers, by Chloe’s people, that there are rivalries among you. I mean that each of you is saying, “I belong to Paul,” or “I belong to Apollos,” or “I belong to Cephas,” or “I belong to Christ.” Is Christ divided? A Jew named Apollos, a native of Alexandria, an eloquent speaker, arrived in Ephesus. He was an authority on the scriptures. He had been instructed in the Way of the Lord and, with ardent spirit, spoke and taught accurately about Jesus, although he knew only the baptism of John. He began to speak boldly in the synagogue; but when Priscilla and Aquila heard him, they took him aside and explained to him the Way [of God] more accurately. And when he wanted to cross to Achaia, the brothers encouraged him and wrote to the disciples there to welcome him. After his arrival he gave great assistance to those who had come to believe through grace. He vigorously refuted the Jews in public, establishing from the scriptures that the Messiah is Jesus. We first find Apollos in Ephesus preaching the Gospel as he understood it. He came from Alexandria, which is in norther Egypt, a city founded around 331 BC by Alexander the Great. later the city came under Roman rule around 80 B.C. Eventually Apollos ended up in the city of Ephesus. Most likely he came there around 52-3 A.D. He was a powerful preacher, “an eloquent speaker”, “with ardent spirit”, and “vigorously refuted the Jews”. He probably preached in the allegorical style of Philo, an influential Hellenistic Jewish philosopher who had lived in Alexandria. Later Apollos traveled to Achaia, the northwestern region of the Peloponnese peninsula. 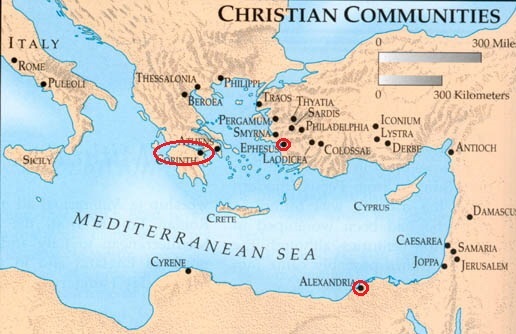 This region was a major cultural and trading area, and included the city of Corinth. My post title is meant to be a bit provocative, and certainly tongue-in-cheek, but one could say Apollos was an evangelist who preached baptism (“he knew only the baptism of John”). He heard the call to carry the word of God to others. He “was an authority on the scriptures” which meant he had a solid and powerful foundation. 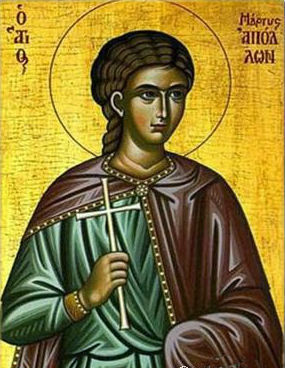 He “taught accurately about Jesus”, but Priscilla and Aquila recognized he did not have the full picture. He was gifted in speech and used his gift, but he did not have the fullness of faith until he was taught it, accepted it, and became a member of that group that was becoming known as Christians, the Church, the Body of Christ. Imagine if, after having heard the whole story from Priscilla and Aquila, Apollos had rejected them. What if he remained comfortable with the ministry he already had, with the knowledge he already had, with “only the baptism of John” such that he had no interest in the full message of Christ and the Way? What if he had no interest in entering the Church, in becoming a Christian? What if he had rejected the Church, claiming the visible, hierarchical Body of Christ was an invention? One thing for certain, we would very likely not know about him now, for his story would not have made it into scriptures. And if he had rejected them, he probably would have done so by marshaling all his knowledge of scripture, and with his gifts of speech, and fought them in debate. Perhaps he would have defended his “simpler” version of repentance and left the resurrection out of it. Perhaps he would have pointed out that the Christians were adding to the story, and they were including the gentiles in the covenant, and the apostles were claiming authority and handing down their authority to others. He might have rejected the Real Presence, saying the Eucharist is only a symbol. Although, given he was a first century Jew, he likely would have had a sacramental view of religion. Obviously I’m making a comparison with Protestantism, and specifically with the Baptist version I grew up in. Catholics claim that Protestants are fellow believers, but that they have rejected the fullness of the faith. When faced with the richness of the Catholic faith, most Protestants balk. There are many reasons for this, not least of which is that few Protestants truly know what Catholicism is, largely because they see Catholicism through “lenses” that only distort what they see (though they would argue otherwise). Fortunately Apollos did not protest. Rather, he heard the full story of the Gospel, he believed, and he became a member of the Body of Christ. And then he played an important role in those critical early years of the Church. Maybe the story of Apollos should be encouragement to Catholics to continue to reach out to their Protestant brethren and explain the Way in all its fullness. And certainly for all of us, the story of Apollos can challenge us to ask if we truly understand the fullness of the faith.